Please DO NOT use softwood shavings!! Softwood shavings are very dangerous 'cos they have aromatic oils which contain phenols & hydrocarbons. These cause liver damage, respitory problems & other health problems in small animals. Even if you use a lot of hay or straw to cover softwood shavings, it still poses a threat 'cos cavies dig & can easily reach the shavings. Research has been done by medical experts, scientists, univerisities, veterinarians & a host of other authorities & it has been proven that softwood shavings are deadly! I am not targeting these particular brands above & the pics are just for illustration. It doesn't matter what brand or variation, ALL softwood shavings are toxic! 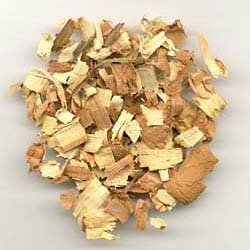 If you are currently using softwood shavings like pine or cedar, or are considering to do so, please read this page carefully. I am aware that softwood shavings are one of the cheapest bedding available which is why people use them. But why would you risk your cavies' health just to save money? Another reason why people use it is they see it used at petshops & assume that if the petshop uses it, then it must be okay. Well, petshops use it 'cos its cheap & that's all they care about. In the following paragraphs in bold, I've two quotes from reliable sources regarding the harmful effects of cedar & pine. "Aromatic hydrocarbons from cedar & pine bedding materials (in shavings form) can induce the biosynthesis of heparic microsomal enzymes (liver disease) (Vesell, 1967; Vesell et al., 1976; Cunliffe-Beamer et al., 1981). In the late 1980's, not knowing of these studies, the House Rabbit Society of California discovered that rabbits who had pine shavings in their litter boxes were coming down with liver disease..."
- Quoted from "The Rabbit Health Newsletter, November 1991". Most petshops & sadly even bedding manufacturers will claim that cedar & pine are fine but don't fall for it! They are only interested in profits & don't care if your pet lives. Do not be fooled by claims or pics of small animals on the packaging. It doesn't matter what variation. It could be red cedar, white cedar or western cedar. It could be natural pine, air dried pine, ponderosa pine, lemon scented pine or chlorophyll pine. They are all harmful & there is medical & scientific proof!! Below I have an email from Pet Food Express, a petshop in America & it states that the owner is aware of the dangers of softwood shavings & has decided to stop selling them. Probably the only petshop honest enough to do so! Another responsible pet shop is the online shop ePetPals. 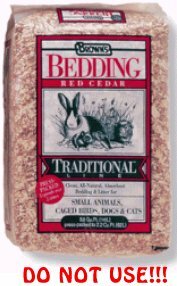 Even though they sell cedar shavings, they make it clear it is meant for dog bed refills & not small animals. 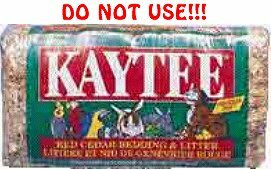 The exact words on their website are "Kaytee Red Cedar Bedding an all natural biodegradable product, Kaytee Red Cedar Bedding naturally repels fleas and many other insects. 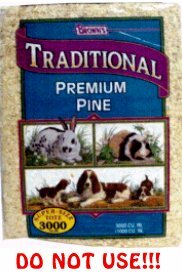 This product (or any cedar product) should not be used for small animal bedding as it can cause respiratory problems. Don't use for Rabbits, Guinea Pigs, Rats, Mice, Hamsters, Ferrets, Birds or any small animals. 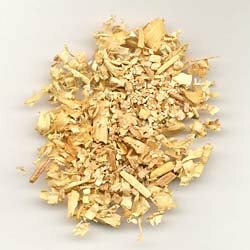 We offer Cedar Shavings for dog bed refills and other generic uses only. So two petshops already recognise that softwood shavings are toxic. Unfortunately other petshops are obviously more interested in making profits to care. But the fact is that more & more people are recognising the hazards of softwood shavings. Some people claim that only cedar is harmful & that pine is safe. That's not true. Now before I go any further, below I have two pics of what cedar & pine shavings look like. Cedar is on the left, pine is on the right. You might see variations of pine which are with specks of green (chlorophyll pine) or specks of yellow (lemon scented pine). Like I said earlier, ALL variations of pine & cedar are harmful! I have more evidence here that shows pine & cedar are harmful. This article was reproduced from the TriFL Information Page. I have also re-produced another article from another website highlighting the dangers of cedar & pine shavings. In case you think I'm making this up, I have an email from the ASPCA (pictured below) which shows that the ASPCA agrees that softwood shavings are dangerous & cedar & pine are softwood! So this should be more than sufficient evidence. If you decide to use either of them, you do so at your own risk! Still don't believe me? Well below I have links to another 55 websites featuring articles on why cedar & pine are harmful. If after visiting all 55 websites & reading their contents, you still insist on using pine, cedar or other softwood shavings, good luck to you! Are Wood Shavings A Safe Bedding Material? 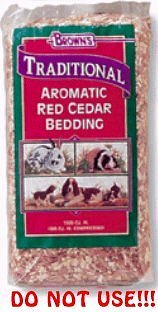 Is Cedar Bedding Safe For Small Pets? Petlovers 101 - Are Wood Shavings Safe For Your Pet? Pics on this page are only for illustration & I am not targeting these particular brands. It doesn't matter what brand or variation, as long as it is made of cedar or pine, they are deadly & shouldn't be used!! Some types of shavings for e.g. Sluis Bedding does not state what wood its made of. Chances are the pet shop wouldn't know & wouldn't care. If unsure, do NOT buy it. In this case, I found out from Linda of Pet Lovers Centre that Sluis bedding is made from pine so it shouldn't be used. Another good example is Supreme Choice Shavings which is also not labelled but I found out that its also made from pine. Another thing you should look out for is fake claims. This might be difficult for new cavy owners but experienced ones would know better. Kaytee has claimed their chlorphyll pine & natural pine are kiln dried pine. But on their website & on the packing it is stated "Natural pine oils help suppress microorganisms". It also says "Contains aromatic oils". We all know that kiln drying is supposed to remove aromatic oils & that kiln dried pine can never contain aromatic oils. So don't you find it wierd how Kaytee's pine can be kiln dried & still contain aromatic oils? I emailed them regarding this & have reproduced their reply below. By recommending aspen if I wanted a bedding without aromatic oils, Kaytee is admitting their so called kiln dried pine contains aromatic oils. They also claim that kiln drying is a drying process & doesn't remove aromatic oils. This as any experienced small animal owner will tell you, is a lie! The whole idea of kiln drying is to remove aromatic oils. Check out the reply below from Nature's Earth Products (makers of All Pet Pine). It clearly states what most of us know, and that is kiln drying removes most of the aromatic oils / hydrocarbons that cause respitory problems. I think its been proven that Kaytee has been misleading people with their claims of their pine shavings being kiln dried & then trying to say that kiln drying isn't supposed to remove oils. This is the kind of wrong information that you should beware off! I know some people say that they've used pine or cedar for ages & their pets are still fine. My point is that there is so much medical & scientific research to indicate that softwood shavings are dangerous, so why take the risk? The best example I can think of is smoking. We all know smoking is bad. Let's say a man has been smoking since he was 18 & has continued doing so for over 40 years. However he's reasonably healthy & has no lung cancer or anything. Does this mean that smoking is fine? Are you going to take up smoking since this chap is fine despite 40 years of smoking? I don't think so! Don't tempt fate & don't take chances. There's no reason to especially with so many alternatives available. I understand that pine & cedar are amongst the cheapest beddings but are you willing to risk your pet's life just to save money? If you are, then you're obviously not a very responsible person! And besides, surely newspaper & meadow hay is equally cheap if not cheaper than softwood shavings! Ultimately the choice is your's but there is a reason why I bothered to do so much research & place it all on this website. I can only advise you but if you choose to ignore me, then I wish your pet all the best! They are toxic! Isn't this enough reason to avoid it??!! Liver damage & respitory problems are amongst other health problems!